Usually, these players learn the hard way that there is much more to the game. Learning why they lose is their introduction to poker theory. On the other hand, poker theory is not the be-all-end-all when it comes to a good win-rate. There are flaws in most players’ strategies, and poker theory, strictly applied, isn’t always the best way to exploit those flaws. With this in mind, today I want to discuss 3 spots in which you should seriously consider the theoretical concept of minimum defense frequency (MDF) and 3 you should definitely not. Editor’s note: This article is fairly advanced and requires some prior knowledge to fully understand. If you have any questions, please leave a comment at the bottom of the page. When should you consider MDF? When building a solid postflop strategy, the first part of the game tree to work on is your c-betting. This part of the game will heavily influence the rest of the game tree, in either a good or bad way. There are several ways to build a strong c-betting strategy. Luckily, we live in the age of poker solvers that can help us improve our understanding of the game, and in this case how good c-betting ranges are built. Minimum Defense Frequency – The frequency at which one must continue versus a bet in order to be unexploitable by bluffs. Range Advantage – Who’s range has more equity? Positional Advantage – The in position player has an informational advantage throughout the hand by getting to act last. Bluff-to-value ratio – The ratio of bluffing hands to value hands that a betting range contains (in terms of total combinations). These 5 factors, along with some less consequential ones, make up the recipe for the optimal c-betting strategy. But the exact measurements of that recipe are still unknown. In other words, no human nor computer knows exactly how much to weight each factor. The best we can do, for now, is use solver software (which is imperfect) to come up with a well-balanced strategy. If you don’t want to use a solver anytime soon, online cash crusher Fried “mynameiskarl” Meulders walks you through a battle-tested and solver-influenced c-betting strategy in the Upswing Lab. See what else you get in the Lab & join here! You should also consider theory when building your 3-betting ranges. Having a balanced 3-betting range will spare you headaches later on by making your decisions clear-cut in most cases. When building these ranges, you need to think about defending against 4-bets. For example, suppose that the cutoff opens to 2.5bb and you 3-bet to 7.5bb from the button. Everyone else folds, and the cutoff 4-bets to 19bb. Note: 16.5 is the amount that he is risking — not 19 — since the 2.5bbs he initially invested is dead money. This means your range should contain no more than 59% bluffs in order to remain unexploitable. Otherwise, the cutoff could print money against you by 4-betting relentlessly. Bet sizing is a key aspect of playing a winning strategy. A good understanding of it leads to extracting maximum value from your strong hands, while giving you the opportunity to bluff as much as possible without being exploitable. Theory is important because whenever you bet, you are offering your opponent pot odds. The goal is to offer them the worst possible odds based on the way your ranges interact with each other. Typically, a 66–75% pot size bet works best. However, there are a situations that call for an overbet, and, more specifically, spots where one player has an overwhelming nut advantage. Misplaying these spots will affect your long-term win rate. Americas Cardroom $0.25/$0.50. 6-Handed. Effective Stacks $50.00. UTG folds. Middle Position (MP) raises to $1.25. 3 folds. BB calls. BB checks. MP bets $1.8. BB calls. Now suppose the BB only bet 75% pot, here. That would be an okay sizing, but it will only allow him to have 30% of his betting range as bluffs in order to be unexploitable. This number represents the amount of times that MP needs to win when she calls in order to break even, and it corresponds to the number of bluffs the BB can have in his range. If the BB was an exceptional player, he would realize his opponent’s range is capped while his range is not. This means that he can use a very big sizing in order to maximize the amount of money that he can win with his value bets and the number of hands he can use as bluffs without his opponent being able to exploit by calling. If you think this is a mistake because MP won’t often call such a big bet, then you are missing a crucial part of the big picture — namely, that all of BB’s bluffs will have a massive boost in expected value. Of course, using an over-bet size also means you lose more when you get called, but that is often a fair price to pay for being able to bluff more often. 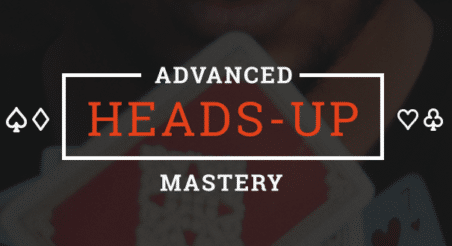 Join theory expert Matthew Janda & strategy mastermind Ryan Fee as they teach you about game theory optimal (GTO) poker in an easy to understand way (2.5 hours). Thus, in order to have a proper defending range against c-bets in the BB, you either need to do a lot of work with a solver or study a strong player’s game. Note: Playing versus c-bets from the big blind is also covered by cash game crusher Fried “mynameiskarl” Meulders in the Upswing Lab. Join us in the Lab here! Here is another spot in which many players falsely believe they should defend at MDF. This is only correct in theory, and you might want to use it when you have no idea how the population plays in a specific situation. That being said, when faced with a river bet you should lean toward either overcalling or overfolding based on your assumptions about your opponent. Generally speaking, the poker playing population under-bluffs on the river, so you will often find yourself overfolding. Similarly, most players under-bluff when they raise on the river. This means you should disregard MDF when you find yourself facing a raise on the river. Your opponents are not likely to have well-built ranges when they raise, thus your strategy should be an exploitative one — overfolding. You should absolutely study theory and MDF, but don’t allow yourself to be corralled by it. You should study it because it will open your eyes to where your opponents are making mistakes. You will learn to distinguish good from bad, and realize exactly where your edge is coming from. This will have positive effects on your win-rate and mental game. Also, understanding the game at a deeper level will give you the confidence needed to withstand the game’s variance, and to keep playing your best despite it. That’s all for this article! I hope you’ve enjoyed it and found it useful! As usual, if you have any comments or feedback, don’t hesitate to use the comment section below. ← How is Brandon Adams so Successful?